The business intelligence study on the global bicycle and components market for the forecast period between 2017 and 2026 is a veritable guide for its many offerings. The report focuses on all important aspects of the bicycle and components market. It examines vital market dynamics such as demand drivers and opportunities, technological advances, and competitive hierarchy that are crucial to present insights about this market. Going forward, the report discusses market segments at length including their market share and revenue estimations. The 10-year forecast of the bicycle and components market presented in this report looks into each and every possible aspect that could determine the growth trajectory during the aforementioned forecast period. The report begins with an executive summary which comprises conventions and notations and taxonomy that are relevant for this market. The taxonomy section provides a lucid market segmentation on the basis of application, technology, component, and geography. The executive summary serves to present the crux of the entire report. Included in this section is growth rate of key segments under different category over the 2017-2026 forecast timeframe. The market attractiveness analysis of key segments is a highlight of the report which market stakeholders can leverage to make best bet. The following sections look into industry value chain and market dynamics. Growth drivers, challenges, trends, and opportunities discussed in the report are supported with proper logic. Regional analysis of the market is also a part of this research report. The last section of the report focuses on leading players in the global bicycle and components market. Furthermore, the section delves into their competitive strategies and provides valuable insights of their market share. The making of the report involved employing standard research methodologies and proven assumptions. In-depth primary research phase involved identifying top industry players, industry connotations, distributors, and manufacturers. It also involved conducting extensive interviews with industry experts and opinion leaders to obtain valuable insights on growth trends. Following a meticulous research approach, the report presents both quantitative and qualitative insights about the industry. The research involved in the making of the report is a multi-dimensional approach to evaluate the embryonic growth of key regional markets. The approach thus helps understand significant trends likely to come to the fore in the bicycle and components market over the forecast period. 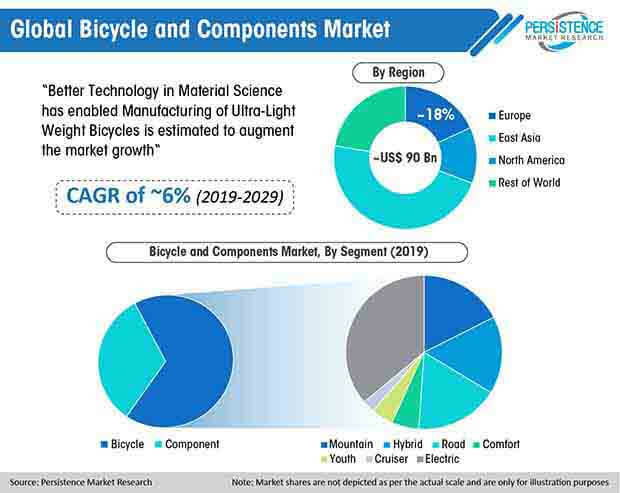 The analysis of revenue projections of the global bicycle and components market presented is another highlight of the report. The revenue estimations presented is (US$ Mn) is crucial to assess the level of opportunity that market stakeholders can look up to. The report comprises a competitive dashboard of the bicycle and components market. It identifies key players in this market profiling each one of them for their distinguishing business attributes. In recent years, the global bicycle and components market has been expanding at a healthy pace due to rising environmental concerns to curb pollution. As the demand for eco-friendly mode of transportation remains at an all-time high, demand for bicycles is likely to expand especially for short distances. In several countries, governments are encouraging adoption of bicycles to be used as a mode of transport to reach metro stations and bus stands. Rising adoption of cycling as a fun and fitness activity is a key factor boosting the bicycle and components market. Cycling helps stimulate physical and mental health, and rising consumer acceptance that this activity fosters health and well-being is aiding the growth of this market. Cycling is increasingly being adopted as a recreation activity that individuals indulge into with friends and family. Health practitioners worldwide recommend cycling as an aerobic activity, and serves as preventive care against several diseases such as stroke, heart attack, some cancers, and depression. Cycling is considered to be an effective activity to reduce or maintain weight as a preventive against several lifestyle diseases. Owing to a number of positive factors, the global bicycle and components market is likely to clock a CAGR of 3.51% between 2017 and 2026. Expansion of retail bicycle sector has also been a key factor bolstering the bicycle and components market. The emergence of specialty bicycle retailers, sporting goods stores, and mass merchants is expected to provide a significant boost to the growth of this market. The emergence of online sales as a significant retailing channel is anticipated to take the bicycle and components market to new heights. In addition, emergence of outdoor specialty stores that have enhanced visibility of bicycles among shoppers is likely to boost sales of bicycles globally. Apart from this, increasing public bicycle rental services is predicted to bolster the growth of bicycle and components market. Bike sharing programs serve to enhance mobility of individuals with an objective to promote cycling, reduce vehicular congestion, and curb environmental pollution. As per an analysis revealed by the Institute for Transportation and Development Policy, in 2014, bikes-share programs are in place in more than 600 cities worldwide. Lastly, increasing number of cycling events globally are also boosting sales of bicycles and their components. Across the world, cycling events at international, national, and local level are on the rise. This is mainly because of increasing adoption of cycling as a profession and as a leisure activity. For example, in November 2016, the U.K. Cycling Events announced the start of the 2017 Brewin Dolphin Velo Series. This series comprises four road cycling events to be held in the country every year. On the flip side, high cost of composite materials that are compatible for newer lightweight bicycles is a bottleneck to the market’s growth. Slow production rate and recyclability concerns of composite materials are also slowing the growth of bicycle and components market. Furthermore, low cost versus benefit ratio accounts for reluctance among small manufacturers to make investments. As manufacturers are inclined to invest in supply chain, the growth of bicycle and components market is likely to impede. Nevertheless, rising disposable incomes and changing demographics in emerging economies such as China and India likely to boost demand for bicycle and its components. Bicycle manufacturers are investing in BRIC nations and emerging economies in APAC to serve the rising demand for bicycles in these countries. Manufacturers are anticipated to reap low-cost production benefits in these countries to transform them into key export-oriented production hubs.